Oven Mitts – Every kitchen has to have a least 1 pair of oven mitts. Yes we can’t be without them, but there is more to oven mitts than just taking the pot roast out of the oven. This maybe a girl thing but there are a lot of things I look for when choosing my oven gloves. I personally have a few pairs that suit multiple needs. I have oven mitts that match my kitchen colours. I have a few pairs of funny oven mitts, some bought for me by friends and family. And I have my heavy duty silicone gloves which are pretty special. They are fabulous oven mitts, great quality and so cute, but Its the humour that makes these mitts brilliant. I promise, they entertain your friends and they they won't be able to help getting some for themselves. Blue Q Oven Mitt "Pizza's Here!" Have you noticed how the culinary industry grew in the last five years? More and more people are getting into cooking, whether it’s for work, hobby, or a small business. One of the kitchen staples, the oven mitt has evolved and can now cater to all sorts of cooking needs. We set out to find the best oven mitts industrial kitchens use as a benchmark for our shopping requirements. But what exactly do we look for in an oven mitt? Functionality? Protection? We wrote this article to give you an in-depth account of what an oven mitt should be. From looking at an assortment of mitts we’ve reviewed, I’d say that a good oven mitt is functional, inclusive, heat-resistant, and flexible. Should We Completely Forget About Using Cotton Fabric For Oven Mitts? Oven mitts are a type of mitten that typically extends to the forearm for better protection against ﻿﻿﻿﻿burn﻿﻿s. Most oven mitts are composed of heat-resistant materials. Are they sufficient for protection from open flames? No. They are only good for accidental burns such as contact with hot stoves and ovens, and accidents involving hot liquids. A good oven mitt must be flexible. It should let you cook without difficulty in maneuvering the items you need to touch and hold in the kitchen. It must let you comfortably and safely hold all sorts of kitchen tools and supplies including a hot skillet, a heavy casserole dish, and a baking sheet. If you get the five-finger design made of silicone, you’ll definitely get better gripping power than if you settle for a cotton fabric. Although the thick oven mitts without the five finger sockets are adequate, thinner and more form-fitting mitts are easier to use. Dexterity is the key to choosing an oven mitt, but it’s not everything. Just try to avoid oversized and extra thick ones. And don’t ever buy oven mitts that are awkwardly shaped. Don’t hesitate to try on a pair though they are commonly sold singly and see if your thumb fits and can move comfortably while all of your other fingers are in. Some fabrics take heat better than the others. Silicone mitts, for example, is excellent in resisting heat. They can withstand temperatures as high as 260 degrees Celsius. If you’re going for silicone, get one that’s FDA-approved food grade. Double oven mitts are an oven mitt variation that features a wide strip of insulating material. They are capped at each end, like a connected pair of mitts, giving you ample protection in the middle too. This is especially useful when trying to lift or transfer a big, heavy pot or pan. With the strip going from one hand to the other, your torso is party protected from the hot edges of the pot or pan. 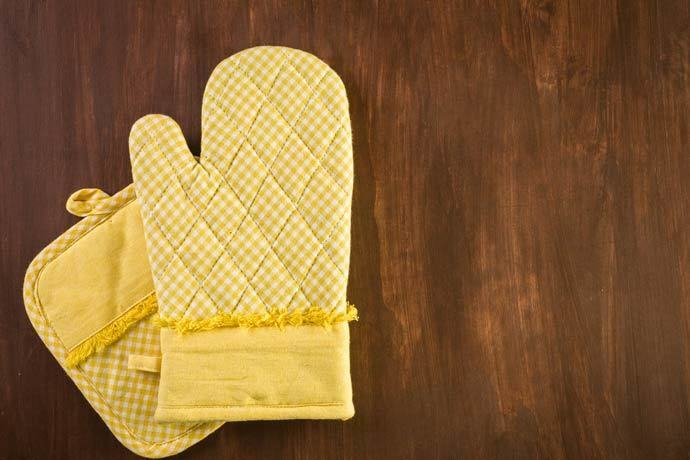 Watch this video if you want to learn how to make your own double oven mitts. While silicone may provide you with better protection while cooking, it’s not difficult to see how some people choose to stick with cotton oven mitts. A cotton oven mitt, for one, has long been part of a tradition. It’s the very first fabric used by manufacturers for mass consumption. It’s a kitchen staple and a bit sentimental. If you want to keep using your cotton oven mitt but you wish to have better protection from burns, there’s a workaround to that. Just have your cotton oven mitt treated with silicone for superior heat protection. A layer of silicone on your existing mitts will help with boiling liquid that may slosh during pot transfers. You can wear a space-age silicone oven mitt and dip your mitt-clad hand in boiling water? This silicone material repels water, and with its excellent heat resistance, you can put your protected hand in boiling water! You can keep your sitting cup of coffee warm by putting an oven mitt over it. The mitt’s insulation will keep your coffee hot or warm for you while you step away from the coffee table. Oven mitts are so functional that you can use them for replacing light bulbs, handling hot engine parts, and for pruning thorny bushes and hedges. Are you tired of burning your skin in the kitchen? Triumphant Chef came up with what seems like an invincible oven mitt for end users. These silicone oven mitts have excellent heat-resistant properties and are 100% FDA-approved. The inner liner is of fabric cotton which is by far the most comfortable-to-touch material to use for oven mitts, and the outer shell is made of silicone for superior grip and heat protection. If your common mishaps in the kitchen are slippage and burns, then the Silicone Oven Mitts from Triumphant Chef are worth trying. Are they easy to wash? Definitely. Just clean with soap and water or run under tap water, and they’re ready to go. 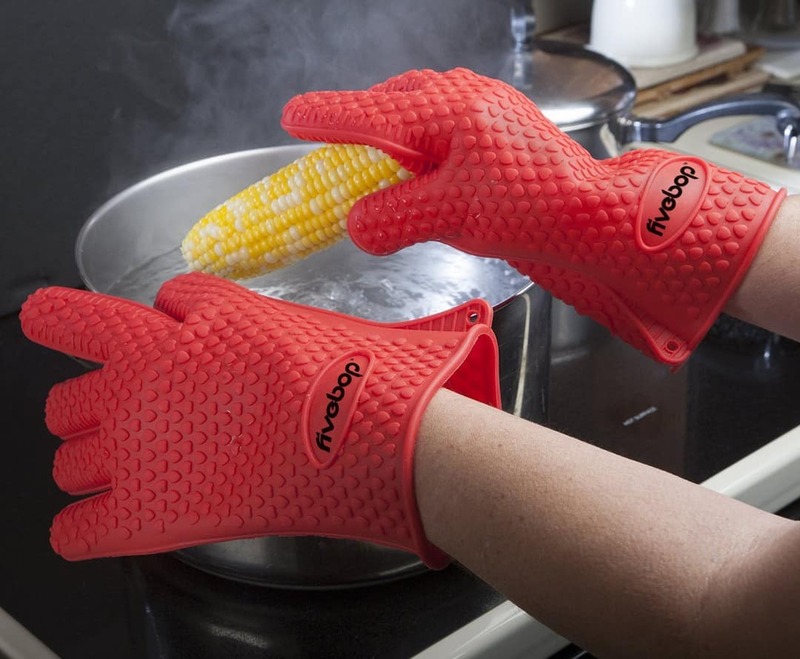 Protect your hands from scalds while cooking with the HOMWE Professional Silicone Oven Mitts. These mitts are 14.7 inches long and features a soft, quilted inner liner. Heat-resistant up to 450 degrees Fahrenheit, and with that length, they are perfect for handling pots and pans used for boiling and frying. HOMWE’s silicone oven mitts are made from commercial-grade silicone. They are 100% FDA-approved, proving they’re non-toxic even with the high temperatures they deal with on a daily basis. They are ideal not only for cooking and baking in the kitchen, but also while out grilling. What about the grip? Not to worry, as the rugged texture of the exterior liner will take care of that. Now here are oven mitts that are perfect for your young culinary experts, or even for the young-at-heart. Fred & Friends Bear Hands Oven Mitts come in pair. Fred & Friends take cooking on a different level with their conversation-starter items such as their amusing oven mitts. Do they take heat well, you ask? Notice the paw pads. Those pads are crafted with highly heat-resistant silicone. 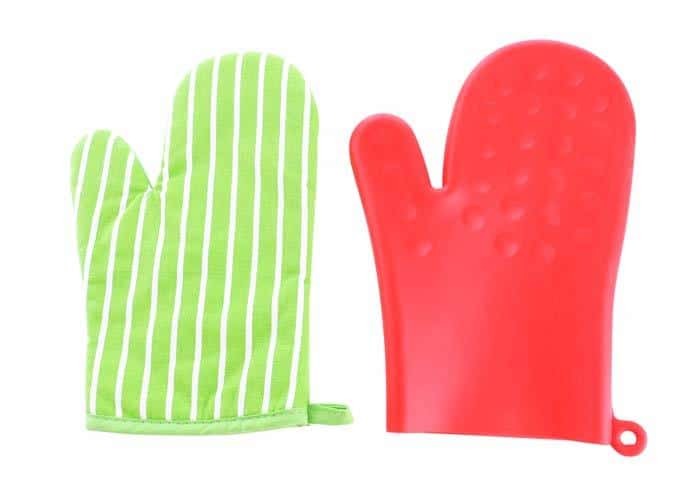 Watch your young cooks use fun and function in the kitchen with the Fred & Friends Oven Mitts. Because of the design, the mitts are a bit smaller than the others on the market, with the younger generation as their target market. The GEEKHOM Grilling Silicone Oven Mitts will protect you better than your regular barbecue gloves as these are three inches longer. You wouldn’t want to scald your forearm while you grill, right? These oven mitts feature five sockets with cotton liner for your fingers. That’s extra protection and comfort. Do they stand up to heat well? 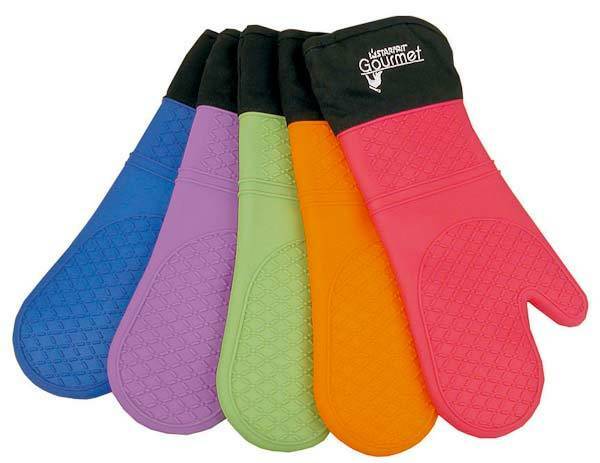 With the GEEKHOM Silicone Oven Mitts, you have nothing to worry because it can stand up to 446 degrees Fahrenheit. Because it’s longer than others, you can handle a casserole dish straight from the oven without worrying that you might scald your forearm with the hot racks. If you want an oven mitt that’s not only heat-resistant but also flame-retardant, then get the Flame Oven Mitts. 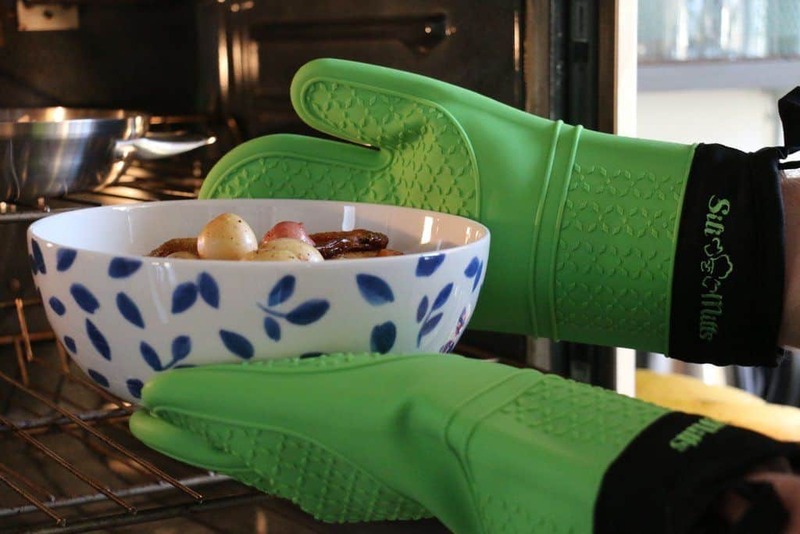 This oven mitt uses a fabric with flame-retardant coating. This makes it versatile and perfect for barbecues and all cooking needs. The oven mitts can take up to 425 degrees Fahrenheit and able to resist flames for 10 seconds. Maintenance is tricky, though because they require spot clean only cleaning. Washing the oven mitts is not recommended as that will diminish the flame-retardant properties in the coating. These oven mitts measure up to 15.5 inches long, giving your forearms protection as well. We’re very particular with our oven mitts because my family consists of self-proclaimed “professional” cooks. One member loves to bake, two work inside a restaurant’s industrial kitchen, and one is a partner in a catering business. So, who’s the winner in our books? Considering quality, features, and price, the Triumphant Chef Silicone Oven Mitts takes the crown. The pair is very affordable and the material used is topnotch in terms of heat resistance. The way it’s constructed also shouts durability which is essential for a home where the kitchen can be an extremely busy place. Do you use any of the above mentioned oven mitts? If not, what are your favorites? Please feel free to share them in the comments below! Don’t forget to share the article too if you liked it!